It's going to be a brief "View" this month as there has been a spate of major disasters and responses to note. We had a fine turnout for the inaugural meeting of the new Flagler ARES® group, which was held April 21 at the county EOC. Flagler county was well-represented, of course, but we also had ARES® members from St. Johns and Duval counties in attendance in a show of support for our fledgling new entity. The meeting was conducted by East Coast DEC Mike Lee, WB6RTH, who discussed the recent history of ARES® in Flagler County, as well as a new "Code of Conduct," a host of plans and an aggressive training regimen. We need an EC to drive these plans forward as soon as possible. It must be the right person, however: someone with the tangible qualifications obviously necessary, but also the intangible characteristics that can make or break an EC as a leader. The EOC has started a weekly test of all communications equip­ment. As ARES®, we now participate in the radio checks with other county assets including the GMRS community, hosts of FM analog repeaters, simplex, and new D-STAR operations. Severe weather moved into most areas of Mississippi on Saturday, April 24, which was well-documented in the national news media. The most significant feature was an EF-4 super cell that formed in Madison Parish and moved through Warren, Yazoo, Holmes, Attala, Choctaw, Monroe, and Union counties with ten fatalities and more than 700 homes destroyed. Yazoo County EC Glenn Patterson, KE5YES, reported that a two-meter ARES® Net was quickly activated to collect information. With William Thrasher, W5PKN, as NCS and help from KE5YEF, KC5MUV, KC5QON, KE5IZK, KE5MQS, and KE5KTU, traffic was passed through KB5GT via HF to served agencies in Jackson. Although the QRN was horrific, Melvin Oubre, W5MLO, managed to relay traffic to William McLarty, KM5GE, at the Mississippi EMA (MEMA) center (operating KM5EMA) and James Spencer, K5CID, at the Red Cross office (operating W5PFC). West Central Mississippi DEC Jacob Lancaster, KE5KTU, reported that at noon on the previous day, the National Weather Service (NWS) office in Jackson requested that SKYWARN activate the Weather Net. Linda Goodman, KE5PYM, opened the net and employed an NWS chat mode via the Internet from her home while operators were en route to the NWS office. Numerous reports were received via the KA5SBK repeater as well as via the Jackson ARC Echolink W5PFR repeater in Clinton in order to contact stations outside of the repeater coverage area. The operators also used 3862 kHz to hold an open net to relay stations' reports. At noon on Saturday, the SKYWARN ops were receiving reports of a possible tornado in Warren County and provided valuable information for the NWS from Vicksburg stations. Subsequently, a tornado was reported on the ground north of Vicksburg. Evaluation of the path indicated that the super cell was heading into Yazoo County. The W5PFC repeater was cross-banded into the Yazoo City repeater, and WX5JAN started receiving damage reports from there. At this point, SKYWARN operators contacted the Red Cross (ARC) in Jackson, and officials requested ARES® operators to activate the station at the local chapter there. By 3 PM, ARES® ops had established communications with the Red Cross in Jackson, the Kings Daughters Hospital in Yazoo City, and with MEMA via a network of repeaters. The following morning (Sunday), the KA5SBK repeater was linked into the Yazoo City repeater and ARES® operators were deployed to the Red Cross Command Post that had been established on I-220 in Jackson. ARES® provided communications between the Command Post and the Red Cross shelter until 10 PM. Again on Monday, ARES® provided communications via repeater link between the Jackson Red Cross and Yazoo City Red Cross. Many ARES® perators were involved in this major effort for SKYWARN activation and Red Cross assistance. EC Richard Morefield, AE5FE, reported that just as the super cell was crossing the Mississippi River into Warren County, the Lauderdale-Clarke Counties ARES® organization was hosting a training session on NTS messaging basics. During the training session, extremely violent weather entered the area, and Russell Brown, W5RB, deployed to the Lauderdale Emergency Management Agency (LEMA) EOC to monitor conditions. During W5RB's transit to the EOC, Charles Blackwell, K5DAD, while at work, initiated an informal weather net to take reports of damage and weather conditions. A tornado was reported by NWS and local residents of the southwest part of the county in the Meehan area. In Warren County, N5JGK, KC5QZW, and KF5GGV deployed to Eagle Lake where some 25 to 30 homes were destroyed. Highway 465, the only road into the area, was blocked by fallen trees. N5JGK hiked his way in and took 20 pictures with his cell phone, which were forwarded to NWS-Jackson for assessment. The storm event also extended to the northern end of the state. EC Timothy Curtis, KD5VMV, reported that the DeSoto County RACES/ARES® group was active during a 24 hour period, April 23-24. The DeSoto County EOC was staffed for the entire 24 hour storm event period monitoring weather conditions throughout northwest Mississippi. Multiple storm reports were relayed from the EOC to NWS-Memphis. Special kudos went to Timothy Jones, N5PYQ, for braving the storm to reset the power supply at the repeater shack after it was tripped by lightning. Alcorn County EC Paul Reiselt, WB5CON, reported that their ARES®/SKYWARN net was activated for tornado warnings issued by the NWS in Memphis. Spotters reported high winds, heavy rain, and dime-sized hail. Union County EC Gregg Fitzgerald, W5LMW, reported that the Northeast Mississippi SKYWARN net was activated. Thomas Hall, WB4VYB, arrived at the intersection of County Roads 127 and 128 just after a tornado had passed. The damage assessment was sent to NWS-Memphis, which issued a bulletin on the touchdown. Also in northeast Mississippi, Prentiss County EC Rickey Norris, WX5N, reported that SKYWARN was activated on the Booneville machine. One funnel cloud was spotted and reported to NWS-Memphis. The Tishomingo County ARC also activated their emergency net. Elbert Potts, WB5VGV, was on the air from the county EOC. It was busy in Lafayette County as well: EC Larry Brown, K5LMB, and AEC Jerry McGregor, KD5JHE, reported that Lafayette County ARES® operated a SKYWARN net, April 23-24, with two tornado warnings being issued. As if one weekend of severe weather wasn't enough, storms moved into north and central Mississippi on the May 1-2 weekend. It was especially busy in Alcorn County. During the morning of Saturday, May 1, the Coca Cola Classic 10K Foot Race was conducted with Alcorn County ARES® providing communication at each mile marker back to the start/finish line. Around 2 PM, after a tornado warning had been issued for the area, the ARES® net was activated. Dustin Brumfield, KD5LAP, and Ricky Gibens, KF5BIF, were in the field spotting when a wall cloud was observed three miles west of the Tishomingo County line on Hwy 72 in the Glen area. Also reported were flash flooding, small hail, and debris. In Lafayette County, a tornado touched down in Abbeville. Assistant EC Jerry McGregor, KD5JHE reported that at the request of Lafayette County Emergency Management Emergency management Director David Shaw, K5MBI, ARES® /SKYWARN members provided continuous weather updates from NWS, news services, and personal computer radar. Emergency personnel often could not hear ongoing NWS warnings. ARES® /SKYWARN kept them up to date for oncoming rain, additional thunderstorms, and NWS bulletins. In Oregon, three separate SKYWARN net activations occurred on May 3. The activations were requested by the National Weather Service in Pendleton. During the morning, the Pendleton office issued Dust Storm Warnings and High Wind Warnings for a large portion of its County Warning Area (CWA). SKYWARN nets were activated on two-meter repeaters (one repeater in eastern Washington and two repeaters in eastern Oregon). Alan Polan, KE4TRR, maintained communications between NWS-Pendleton and the SKYWARN net control stations that operated the nets in Yakima County and in Deschutes County via the repeaters. Polan used EchoLink to communicate with the net in Deschutes County on the 147.360 MHz repeater via the Bend EchoLink node repeater and the Umatilla EchoLink node repeater. Michael Wright, N4MAW, EC, Wilson County Amateur Radio Emergency Service, responded to the Wilson county, Tennessee, Emergency Management Agency's EOC at 4 AM on Saturday, May 1, upon their request and activation of the EOC Weather Operations Team. Wright brought the EOC's HF station on line and began monitoring the Middle Tennessee Emergency Traffic on 3.980 and 7.232 MHz as well as the local 147.105 MHz repeater and the 443.725 MHz repeater (MTEARS Net). The heavy rains arrived later that afternoon. At 1:30 PM Wright called for the ARES® net to be convened in an informal mode to begin taking reports on the arriving weather, flooding, road conditions, and to provide updates to the operators monitoring the frequencies. Numerous reports of flooding on local roads as well as I-40 in Wilson County were received. Dave Bonner, KJ4BLG, was deployed to assess the main ingress/egress routes for Watertown upon the request of Wilson EMA officials. Bonner was able to safely determine that the routes were impassable; Watertown was isolated due to flooding. Bonner also reported that residents were evacuating their homes in Watertown and a shelter was needed. Through his efforts, WEMA officials were able to get the Watertown High School opened up as a shelter for evacuees. Seven radio amateurs in Wilson County checked into the net and provided valuable flooding information to WEMA officials throughout the day. On Sunday, Tom Parker, KB4SFN, responded to an NWS request, and the ARES® net was again active in support of WEMA and its response to the flooding. Again, numerous reports of flooded roads and isolated subdivisions were received and passed onto WEMA officials. The Watertown Fire and Police repeaters went down and ARES® ops received the report and notified WEMA, Wilson County 911, and the Middle Tennessee Electric utility of the situation. ARES® also prepared to send an operator to the Watertown Police and Fire station in order to assist with getting emergency responders en route to any emergency should the repeaters not come back on line quickly. Bob Rogers, KB4PYP, EC of Davidson County, Tennessee, reports that on the weekend of May 1-2, the Office of Emergency Management (OEM) requested ARES® support, with 23 operators responding. Rogers stated that their "SKYWARN net was in standby for most of the day on Saturday as we watched the approaching storms." The OEM went into full activation and Rogers was called in to the "War Room" at 7 PM where he remained until early Sunday morning, when he had to return home to deal with water seeping into his bedroom. The SKYWARN net remained active until the front passed. By 5 PM on Monday, a Red Cross shelter at Bellevue Middle School had requested an operator to support communications needs as there was a lack of cell phone service. Two operators established communication systems to support the shelter for emergency medical support. The Cross Point Community Church also requested ARES® assistance with distribution of supplies. Seven ARES® members deployed there. On Tuesday, May 4, Red Cross requested radio communication support for a relocated disaster headquarters at the abandoned Skyline-Madison campus on Neeleys Bend, where 12 ARES® members participated. Communication was established between Red Cross-Charlotte Road office and the Disaster headquarters. A report was sent to the Cheatham County EMA. Rogers said "while operating our net in support of the Red Cross shelter operation I received a call from an ARES® member in Cheatham County reporting that his neighborhood was isolated by flood waters. He and his neighbors were running out of fresh water and food supplies. I called K1KY on our MTEARS frequency and obtained the phone number of the Cheatham County EMA office and reported to them that 75 people were in need of fresh water and food supplies. Two helicopters were sent with supplies by the afternoon to those stranded people." The new Florida Hurricane Net is an affiliation of D-STAR repeater owners who want to provide the resources of their repeaters to hurricane preparedness, planning and response. The net is operated and sponsored by ARES® members and groups statewide. The Florida Hurricane Net meets on Monday evenings at 9 PM. Interested operators who have D-STAR capability, either through Dongle or Repeater, are highly encouraged to check into this net on a regular basis. The net will serve as a platform for statewide training and as an advisory point for severe weather updates to and for all emcomm groups, primarily during hurricanes but for other severe weather events and disasters as well. It is anticipated that Digital Data (D-RATS) use and training will also be incorporated into this net as it develops. In "Bike MS: Deloitte" (Georgia), a bicycle ride raising funds for the Georgia MS Society, bicyclists covered paths up to one hundred miles between downtown Atlanta and Athens and returned, on April 10 and 11. A number of Amateur Radio organizations supported the ride in a display of cooperation and capabilities. allowed the use of their D-STAR two-meter repeaters W4DOC and WX4GPB. The Tri-County Amateur Radio Club allowed the use of their 70-cm D-STAR repeater WJ4FD, and WA4YIH installed a portable 70-cm D-STAR repeater to support the primary communications for the operation. The Alford Memorial Radio Club and the Lanierland Radio Club allowed the communicators to use their FM repeaters for operations. The bicycle ride support effort provided an opportunity to demonstrate the capabilities of D-STAR. All the participating repeaters were connected to reflector 30B, a reflector designated for use by Georgia ARES®. The Georgia Emergency Management Agency (GEMA) loaned 20 ICOM IC-2820 radios to the operation .These radios were equipped with Power Pole connectors and programmed by John Davis, WB4QDX, and Scott Hartlage, KF4PWI. A standard single mode configuration was used to make operation by participants new to D-STAR equipment as simple as possible and a simple two-page instruction sheet was prepared by WB4QDX for the operators. All the SAG vehicles used to support the race had their GPS units active so positions were reported each time the microphone was keyed. In addition, break points and the lunch points had operators stationed to coordinate needed information flow including getting food to break points and the operations center. Net control and bike ride officials were able to keep tabs on the riders as they traversed the course from downtown Atlanta to downtown Athens on Saturday and return on Sunday. The use of D-STAR provided a novel approach to tracking vehicles using the same radio as used for voice. Previously it was necessary to operate two radios: one for voice and one for traditional APRS. With the integration in D-STAR's data channel and integrated GPS, one radio was all that was needed. The ability to link all repeaters digitally provided a uniform operation without all the variables normally encountered in analog linked repeater systems. Having a seamless network allowed ride break point managers and the operations center to maintain a view of the entire course, even though the various locations were on different repeater systems. The projected display of vehicles over the mapped route proved helpful to visualize what was transpiring, even getting a wayward SAG van back on course. On April 17, the Murray County (Minnesota) Amateur Radio Club was on hand for the Honor Flight 5K Run/Walk, which was held in Slayton. There were approximately 150 runners/walkers for the event to help raise money for World War II veterans to fly to Washington, DC to visit the WWII Memorial. 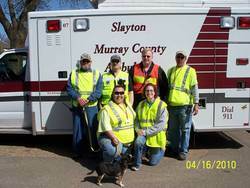 Murray County Amateur Radio Club members helped with the safety of participants and traffic control at intersections along the race route. There were six operators covering the 5K race route with one operator (an EMT) riding with EMS in case anyone was in need of assistance while running the race. Murray County Amateur Radio Club members of southwest Minnesota. the radio club at the main intersections on the route stopping the traffic for them. The Murray County Amateur Radio Club has been asked to assist in the future for other 5K Walk/Run races. We presently do not have any ARES® deployments as a result of the oil spill. My take at this point is that we likely will not have any. Unlike an event that interrupts normal communications infrastructure, served agencies are using their normal means of communications utilizing cellular, normal commercial and private systems. Following the established Incident Command System protocol, the Parish Emergency Manager or his logistics designee can request additional communications resources, including Amateur Radio, using a system called "WebEOC." This system provides authorization directly through the Governor's Office of Homeland Security and Emergency Preparedness (GOHSEP). We have an ARES®/RACES liaison at GOHSEP who will coordinate those requests with us if they occur. Other volunteer agencies can request our resources through the Louisiana Voluntary Organizations Active in Disaster (LAVOAD). SEC Jim Coleman, AI5B, and I are participating in the LAVOAD conference calls as they are scheduled. The garbage bag is the most overlooked yet most practical single item available in an emergency. Not only can it protect you and/or your equipment from a variety of climatic conditions, it facilitates carrying items ranging from your most expensive equipment to trash from an abandoned site. From David Coursey, N5FDL: http://nationalmap.gov/ustopo/ Looks like something for SAR and ARES® operators! See also David's Web site N5FDL. As reported in the last issue, it's a bleak outlook for this year's hurricane season. Living on the exposed east coast of Florida, I am personally in the middle of a potential ground zero for catastrophe. It is deeply gratifying to know that Florida is home to some of the finest and most active ARES and RACES planning, training, and exercising in the country. A new statewide ARES emergency plan is in the works, being drafted by an elite group of ARES and State EOC officials. We have had the good fortune of having excellent leaders in our Section Managers and SECs (we have three ARRL Sections in the Sunshine State). I feel that ARES and indeed, Amateur Radio at large, is in very good hands here. It brings to me a sense of safety and security in my home, just a mile or so from the edge of the ocean. But, I, as well as every radio amateur and citizen in the state also have an obligation for personal preparedness, and planning. Here is what I've done so far for personal readiness: stocked my closet with one case each of canned fruit, mixed vegetables, and baked beans; pasta, instant rice, and about 30 gallons of fresh drinking water. I've laid in a good supply of extra batteries, flashlights, candles, cat food, cat litter, gasoline in extra tanks for the truck and motorcycle. I've pre-bagged sand bags for stacking against rising water. I dusted off the Radio Shack NOAA weather alert radio, plugged it in, tested it, and made sure I had extra batteries for it. I bought several small propane canisters and a stove head for them. I bought a back-up stove as well. Still to do: I need to buy a new hand-held, and will probably buy one of the Yaesu units I tested for June QST's Product Review - they are so inexpensive these days! I'll buy an extra battery for the unit, too. I also need a gel cell for my HF and 2-meter radios on the desk here. As for planning, I know exactly what I will do if threatened by a hurricane: Go straight to the hospital in Daytona Beach, where I work on the ICU. I will stay there until the event is all over. Incidentally, it's the tallest set of buildings around, and a new D-STAR repeater is being placed on top of one of the towers there. I can also bring my cat there for the duration. Hospital administrations think of everything when it comes to potential disaster situations facing the community - it is deadly serious business.